I still maintain this IDE once in a while, but I'm not using it much anymore. 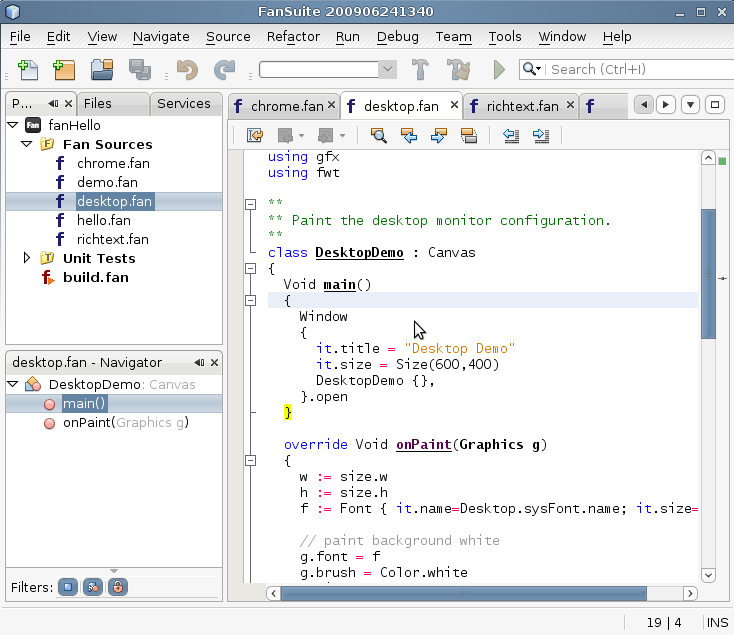 I now use the pure Fantom IDE, called Camembert I've been developing recently. On top of that you benefit from all the great built-in Netbeans features such as git/mercurial support, extra plugins availability and so on. Also any other features you need, say hudson support are just a few clicks away under tools/plugins. You can also check a demo "screencast("movie") in the demo section. I have written the Grammar/Lexer/Parser using the ANTLR tool (together with the great ANTLRWorks debugger). On the Netbeans Side i'm using the brand new (NB 6.7) CSL API (Language support). Learning ANTLR has been a challenge as well as the new CSL API, which is not yet much documented. Many thanks to Geertjan Wielenga as well, for all the useful tutorials / blog entries he made available. And all the authors of the other NB plugins I've been looking at. JavaOnTracks: My own java frameworks. I use some templating and database features.